This Battle East Sussex website is a one-stop-shop for [accommodation] including [hotels], [bed and breakfast] and [self catering] apartments. The Battle site also gives a rundown of [things to do] in town, tips for [shopping] and the best [restaurants] to visit. This quaint and attractive medieval town got its name from the famous battle of Hastings which saw William the Conqueror’s Norman army defeat the Saxon King Harold in 1066. It is said that the Saxons defended from the top of a hill but William ordered his men to fire arrows up towards the crest. King Harold was killed, according to historians, when an arrow struck him in the eye. 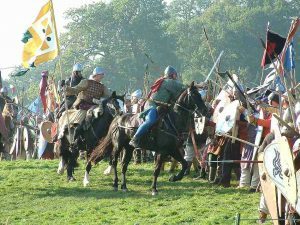 The Battle of Hastings was pivotal in English history. The Saxons were replaced by Norman rulers and ushered in an era of building in stone whereas most buildings before that time were made of wood. History claims that William vowed would build an abbey if he defeated the Saxons and in fact, he ordered the construction of the Abbey of St Martin in 1070. The abbey was completed in 1094 and the main altar is believed to be on the spot where Harold fell. The town of Battle grew around the abbey as trade and commerce increased prosperity in the region. The abbey is in ruins these days and they are cared for by English Heritage Fund. The formidable abbey gatehouse, which was completed around 1338, can be seen as you look down the length of Battle’s High Street. Although the town is much older, Battle has some striking Georgian buildings consisting of cottages and large houses which date to the 1700s. The parish church of St Mary was built in Norman times in the 12th century. The church also houses some rare 14th century fresco wall paintings as well as a Norman baptism font. At the Northern end of the High Street, visitors will find the Almonry, which is where alms for the poor were distributed. These days, the Almonry houses the Battle Town Council and the Museum of Local History.